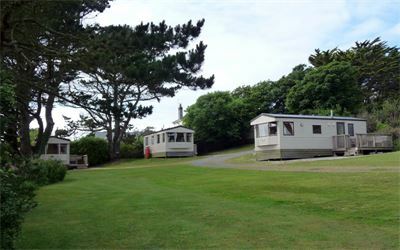 Five individually sited holiday caravans are available for hire at Lower Treave. Each has their own sun deck and parking area. Set amongst the trees and hedgerows, they come fully equipped with all the conveniences of modern life. There is a full sized cooker, fridge and micro-wave, digital TV and DVD player, and a comfortable bathroom with WC, hand basin and thermostatically controlled shower. All of the beds have sprung mattresses and the bedrooms have wardrobe space and plinth heating.